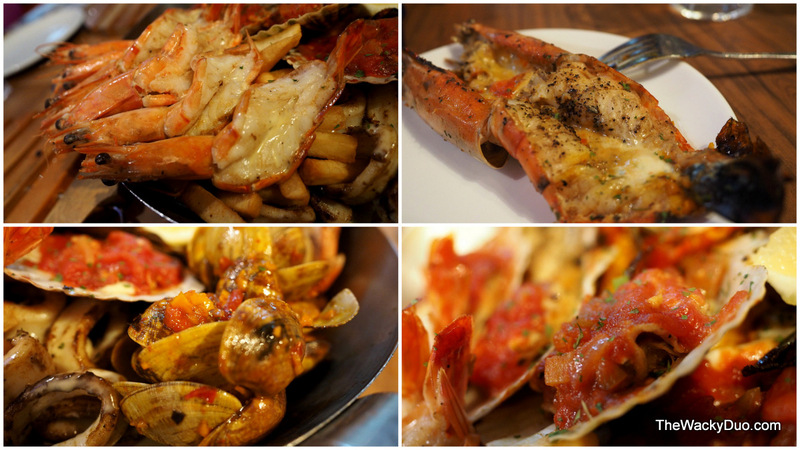 Fish & Co. is no stranger to most Singaporeans. Serving Seafood in a pan, it had been a local favourite in Singapore since 1998. It has also been the wifey's place of choice for seafood when she has a craving for fresh tasty seafood since our courtship days. Surprisingly, we had not been to the Fish & Co Glass house at Park mall even though we had been to other outlets in Singapore. So when the offer from Fish & Co came to have an early Mother's Day celebration at Penang Road, it was a good chance for us to sample the specially prepared meal for Mommy in this iconic building. The Mom's Platter was our meal for the evening. This sumptuous meal features a beautiful medley of delectable seafood. Mom's Platter @ Fish & Co.
For seafood lovers (especially moms) , the generous portions of succulent king prawns, juicy scallops, calamari and prawns that are grilled to perfection and comes accompanied with Fish & Co.'s very own unique creation of curry batter clams would be a delightful meal. The meal is complete with raisin butter rice and fries that the children can partake in. The Mom's Platter is priced at $65. It is ideal for sharing with a family of up to 3 adults. If Mommy has a choice, she would probably have the whole pan by herself! As part of this special promotion, Fish & Co. is extending a complimentary Fish & co. membership with every purchase of a Mom's Platter. Membership perks include 15% points rebate on your spending all year round, 20% points rebate on your birthday month , priority reservations and more.The Mom's Platter is available from this weekend from 4th May to 11 May 2014 at all Fish & Co. outlets. So make your reservation early! Get hooked with Fish & Co.
To complete your meals, do check our their desserts. We recommend the Triple Chocolate Treats or the Hot Fudge Cake. These treats will surely make a delicious meal more SWEET! Go ahead, bring the seafood-loving Wife or Mom to Fish & Co. for a treat. Do book your reservations early. From experience, many restaurants would be experiencing full house during the Mother's Day weekend. On the side note, we discovered that the boys had quietly sneak off during dinner and had their photos taken by fabfoto. A special thanks for their hospitality given to the boys, especially when we found out that they had taken 10 sets of photos all on their own! Thanks to Fish & Co. for the lovely dinner treat. Together with the activities planned for the evening, the family had a pleasant evening.